Sgt. William “TJ” Edwards – Part 3 Never Quit! Sgt. Edwards was injured December 9, 2006, with burns on 45% of his body, yet a month later, he was out of that hospital bed walking around. On March 1st I received this picture of Sgt. Edwards at the burn center. It had been taken a short time before. 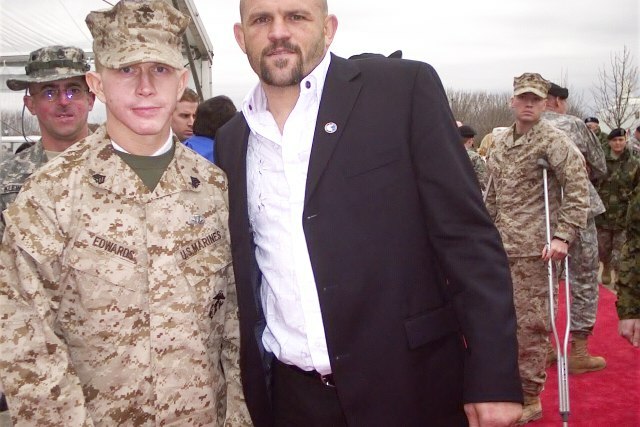 You may know who is standing there beside him, Chuck Liddell. Mr. Liddell, a professional fighter from the “UFC” had stopped by to visit the Marines and soldiers who were patients there at the burn center. By now it is April of 2007, and Sgt. Edwards has flown from Texas back to Okinawa to be there for the arrival of the 3rd Recon Marines and their homecoming. It would take approximately 9 months for the wound care to be completed for Sgt. Edwards. While Sgt. Edwards was there with TOW Company, he accomplished many things. He worked in the shop to better organize it, setting up a system for gear distribution for drill periods, by simplifying the way this was done. He took the time to make sure that each vehicle had the exact same equipment in it, that the men would “instinctively know how to use it.” He also trained the incoming communications chief. Remember that Sgt. Edwards' MOS was in communications, and thankfully he was not being hindered in doing that work as a result of the burns he had sustained. In addition to training the new chief, he organized the information for him into binders that would be easily and readily accessible. He took the knowledge he had gained from working in communications and transferred it into those binders. He streamlined the communications shop to lessen the stress involved when it came time for inspections. Inspector-Instructor at the Broken Arrow, TOW Company) and 1stSgt. (Ret.) Ochoa (former 1stSgt. at the Broken Arrow, TOW Company). Have you noticed a pattern that revolves around helping others here? It seems that Sgt. Edwards is the kind of man who actively chooses to step in and help others, and a lot of that has been done on his own time. Full recovery however, involved more than just being there and working with TOW Company. Sgt. Edwards needed to recover both physically and mentally. He had proven that he was capable of the mental challenge by all his hard work with TOW Company, getting it organized more efficiently. But what about the physical challenge of being a Marine? Currently Sgt. Edwards is listed as active duty, with a no duty status. He is still waiting to hear back from the Medical Board on whether or not he will be cleared to return back to duty with the Marine Corps. 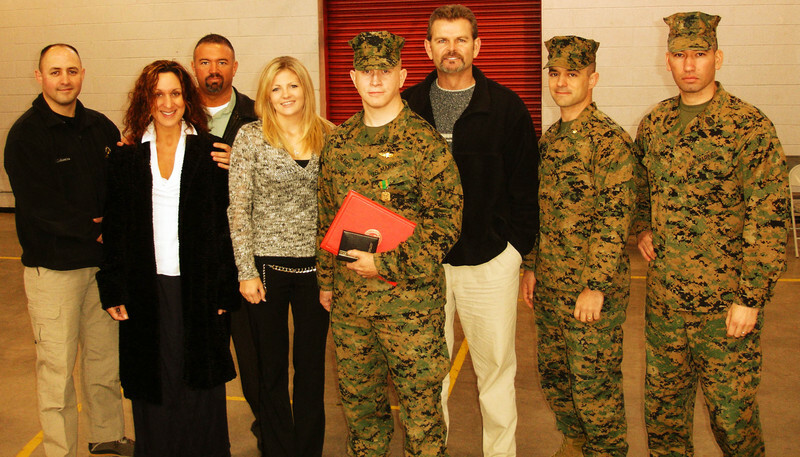 He passed his Marine Corps Physical Fitness Test just 9 months after the Iraq incident. He then went on to run in the Marine Corps Marathon last year, after a fellow wounded Marine offered encouragement. He has completed several endurance events, and joined the Team Semper Fi. Team Semper Fi consists of a group of Marines who were injured in Iraq. They compete in various events such as marathons, to raise money for injured veterans. So what do you suppose the Sergeant is doing while he waits to hear back from the Medical Board? If you guessed he might be volunteering, you would be right. Sgt. Edwards does manage to squeeze in some fishing between running marathons, triathlons and volunteering at BAMC. He spends time visiting newly wounded veterans at BAMC. He does so in order that they have the faith to know they are not alone in the hospital. His presence is a great comfort I am sure, as only one who has been there can understand what they are going through. I can’t begin to imagine how hard it must be each time he walks back into that hospital, yet he continues to do so, to inspire those men and women to never quit!